IPT in coordination with the Village Mayors Assembly of Jbeil organized a conference, to sign a memorandum of understanding and launch the “Jbeil Village Mayors Loyalty Card”. The conference was held on the 12th of April 2019 at Byblos Sur Mer hotel in Jbeil, in the presence of Dr. Toni Michel Issa, President of IPT Energy Center (IPTEC), Mr. Michel Gebran, President of the Village Mayors Assembly of Jbeil, Qamacam of Jbeil, ME Nathaly Merhi Khoury, in addition to Jbeil village mayors. This unique card was launched as part of IPT’s CSR initiatives supporting social development and prosperity for all. 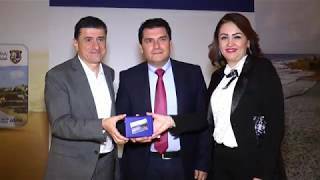 Jbeil Village Mayors loyalty program aims to support the Mayors’ voluntary work in their villages by allowing them to collect funds which will be forwarded by IPT to Jbeil Village Mayors Assembly’s cooperative fund. Dr Toni Michel Issa, President of IPT Energy Center (IPTEC), delivered a speech in which he praised the important role of Village mayors who serve all citizens and work for the development of their villages, especially in towns and villages where there are no municipalities. "This is the reason behind the ongoing cooperation between Michel Issa Foundation for Local Development (MIF) and the Village Mayors Assembly of Jbeil", he added, "one of our most successful projects launched so far has been the micro-credits project which has helped many craftsmen and small business owners in Jbeil kaza to develop their work and to promote it". For his part, Gebran thanked IPT for this initiative that benefits the village mayors, stressing on "the importance of activating the cooperation between the public and private sectors and the urgent need to involve private sectors in productive development projects to achieve economic development"
"IPT is a pioneering institution in the field of social services especially in Jbeil region, where we have witnessed its involvement in several activities related to social development. This unprecedented initiative will fuel Jbeil Village Mayors' development activities which is one of the main pillars of public service. We invite institutions in the private sector to follow the IPT's lead in social responsibility".